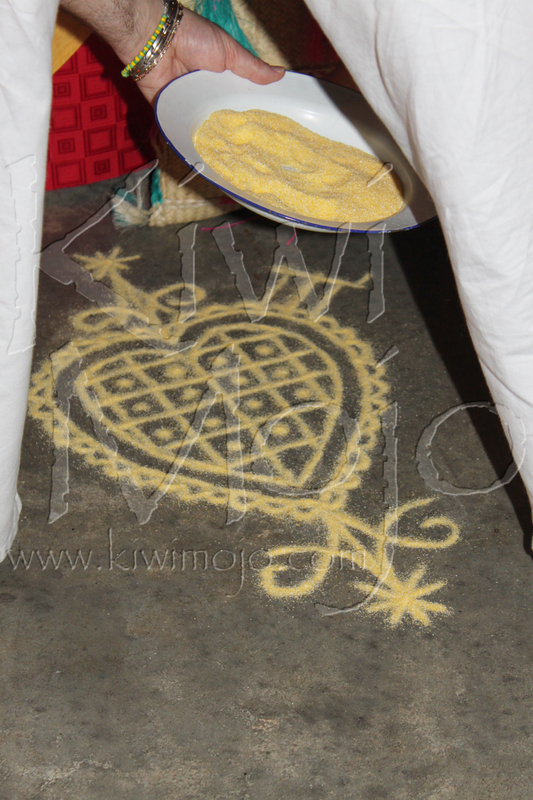 A selection of photos from Hounfo Racine Deesse Dereyale’s Fet Dantor, July 20th 2013. 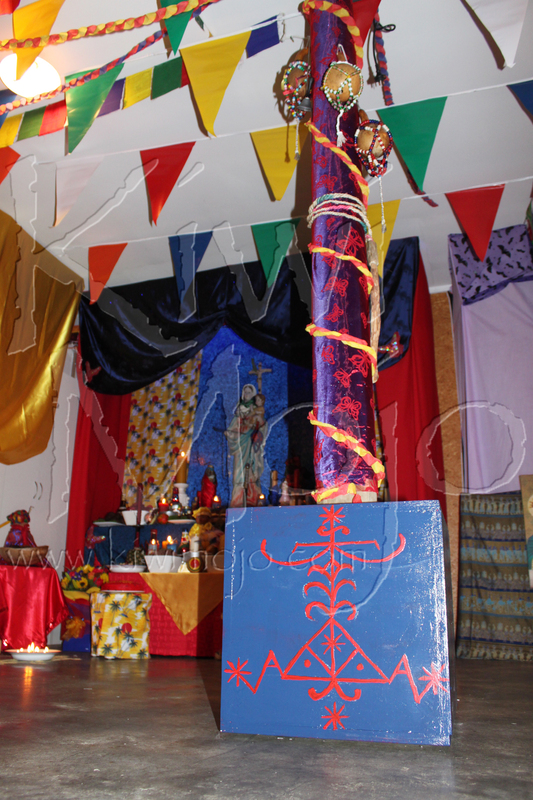 The completed altar for Fet Dantor, including the lower level for Ti Jean Dantor. 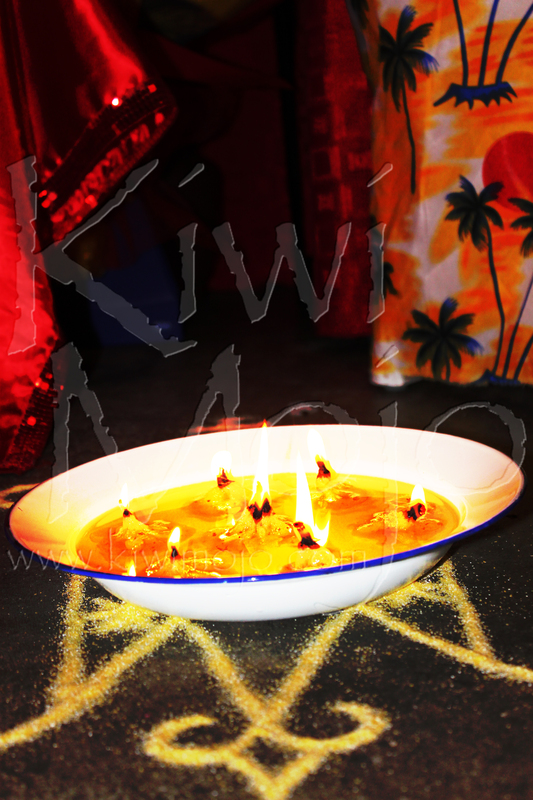 Lights have been set, and the favourite foods of the lwa have been placed upon the altar. 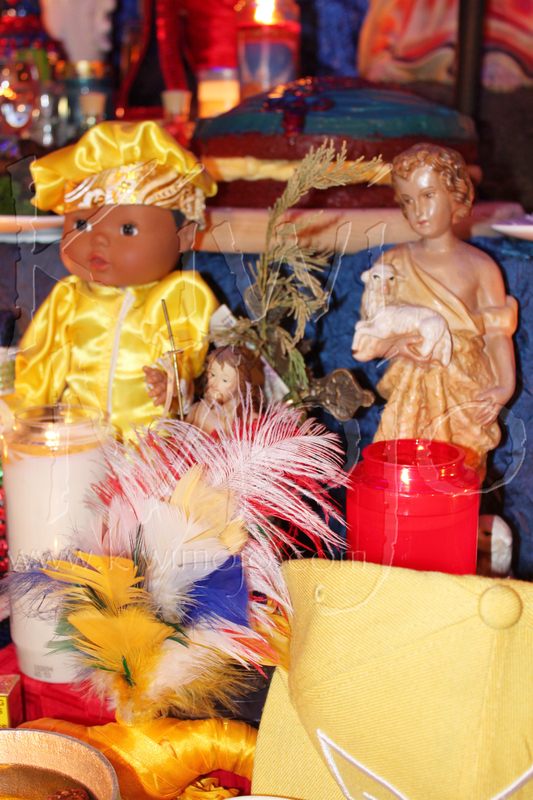 A bouquet of flowers sits on either side of the altar. 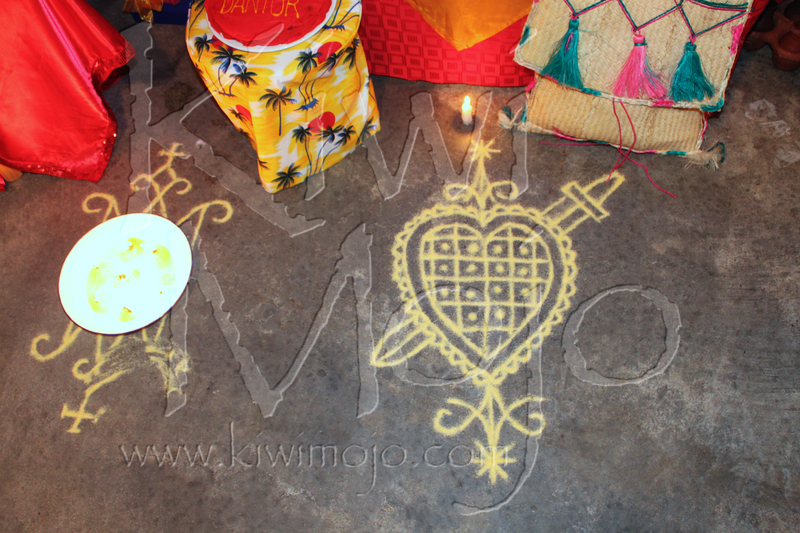 The corners of the table are decorated with butterfly motifs, as the butterfly is associated with Dantor. 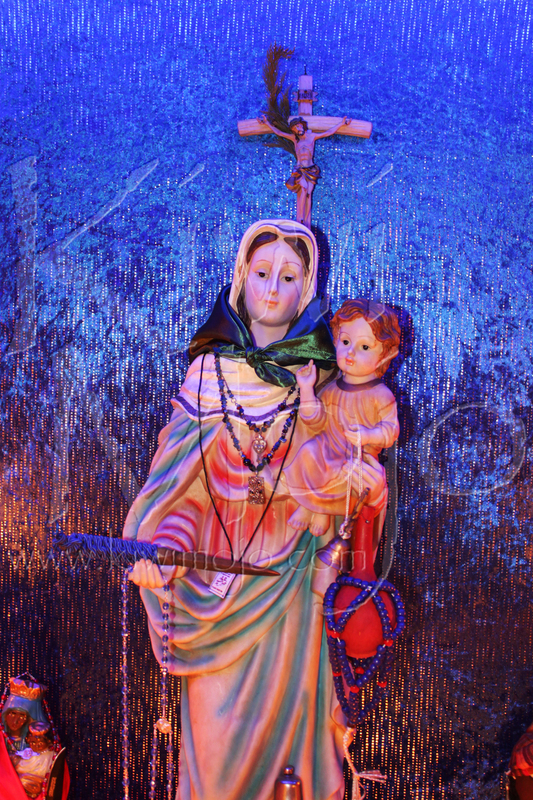 This is the Hounfo's large statue of Erzulie Dantor. 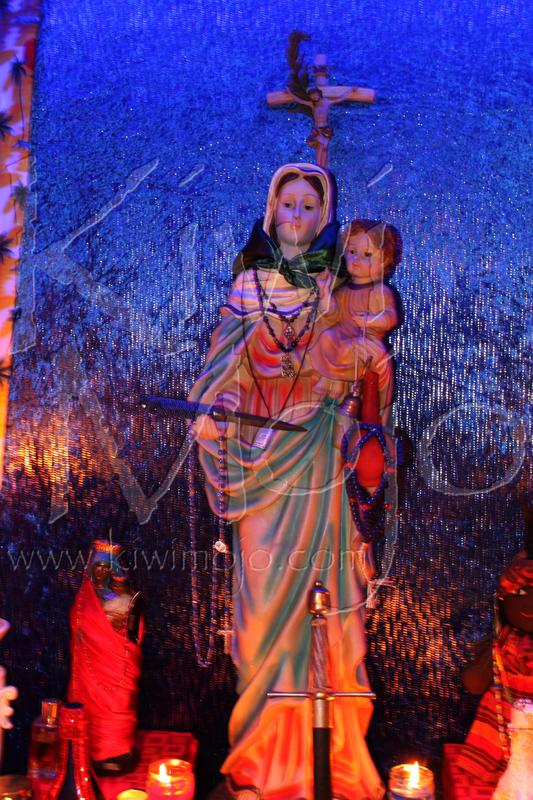 It is surrounded with smaller statues and candles. As everything is done before God, a crucifix is placed in the centre of the niche. You can see it here, hanging behind the statue. Cake is a very important part of any fet. 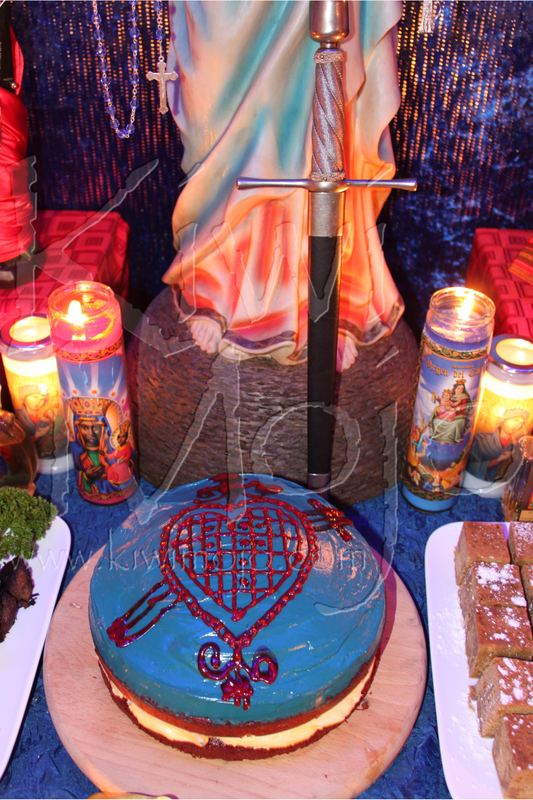 This one is a red velvet cake, iced in blue cream cheese icing. Houngan Alistair piped the veve onto the top of the cake using red icing. 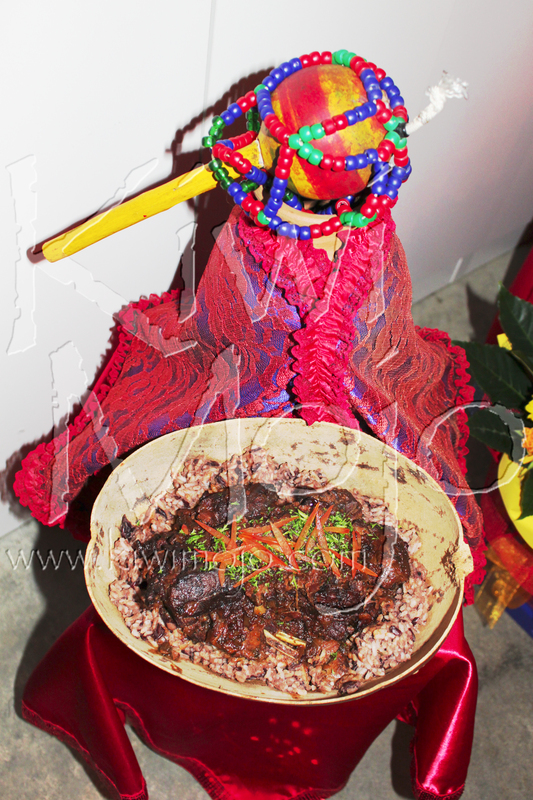 Dantor's govi, with the tcha-tcha used to salute her and a dish of Haitian style goat stew. 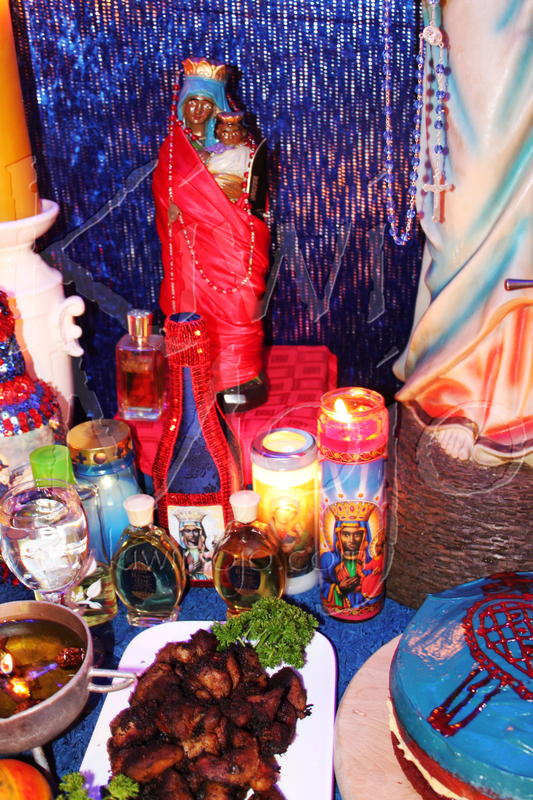 A statue of Erzulie Dantor is raised above her offerings: wine, candles, a lamp, foods and her cake. 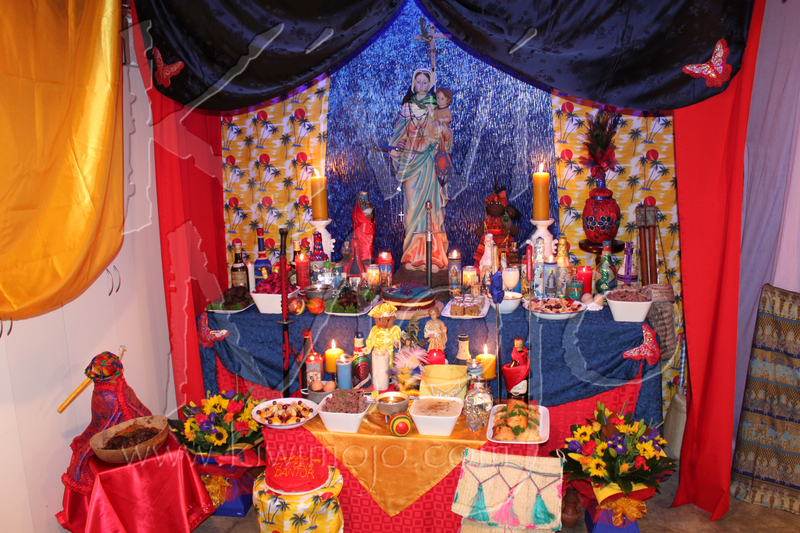 Dantor's govi sits above and behind a plate of fruits, beans and rice, and candles. The bottles for several of the Rada spirits, who are served before we get to Dantor, can also be seen in this image. 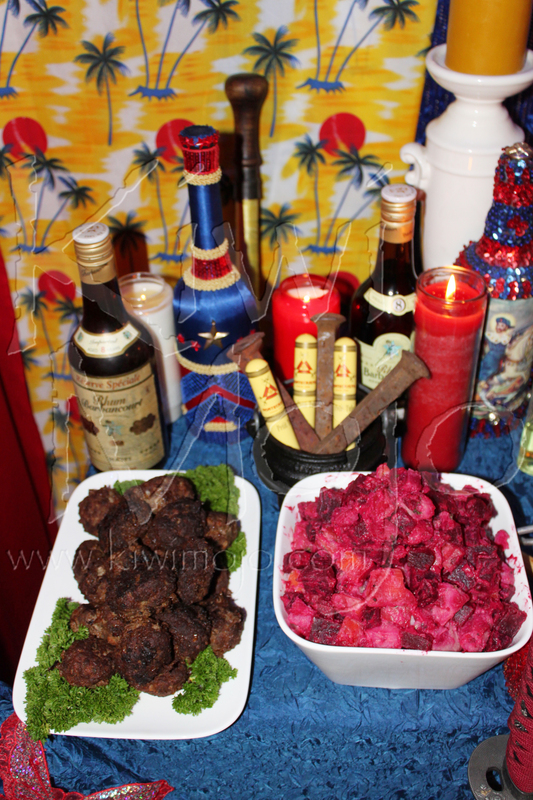 The left side of the altar, with griot, Haitian style beetroot salad and meatballs. 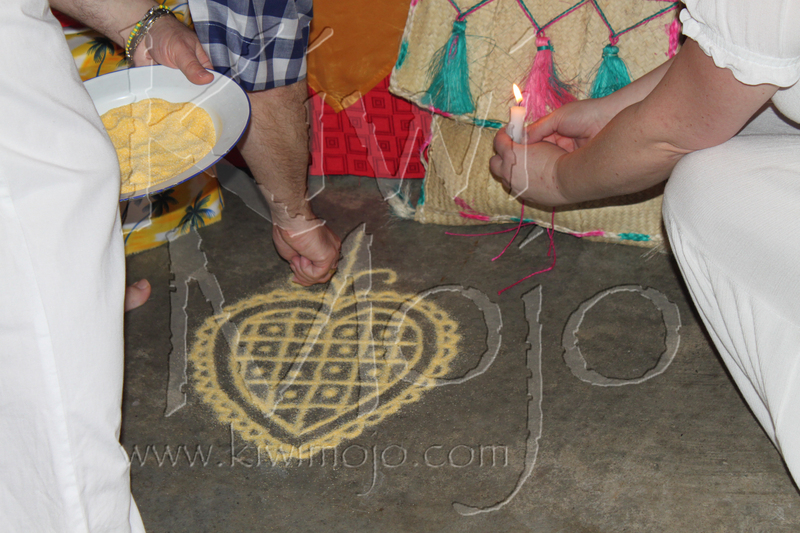 There is also a strong petro lanp set inside the chodje. 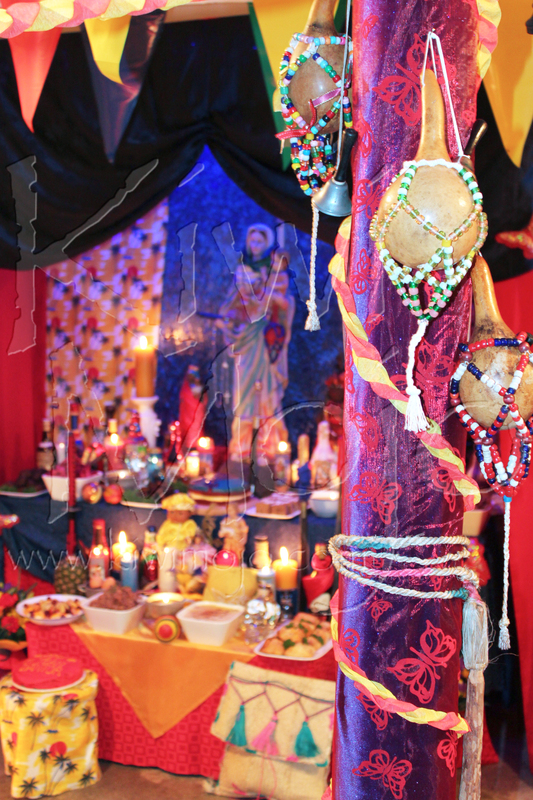 The lower level of the altar prepared for Ti Jean Petro and Ti Jean Dantor. 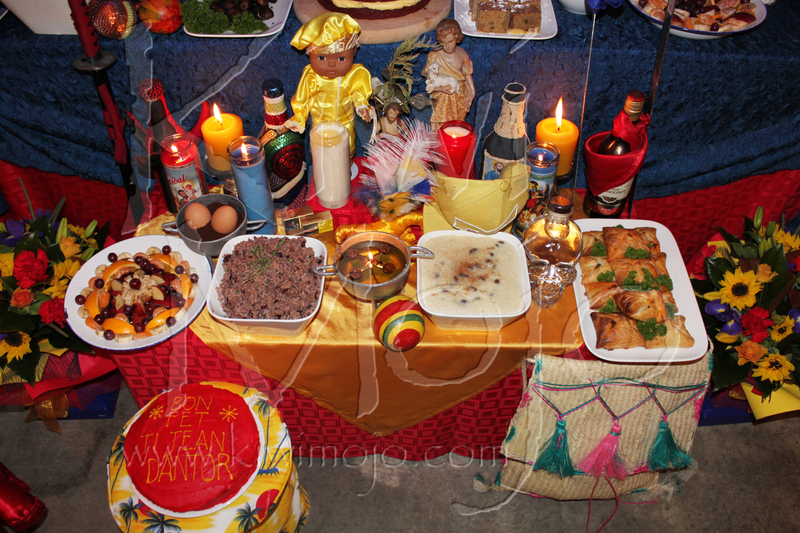 Included here are fruits, Haitian beans and rice, Haitian style rice pudding, and pastries. There's also his cake iced red and yellow. When we feed them, we really feed them! 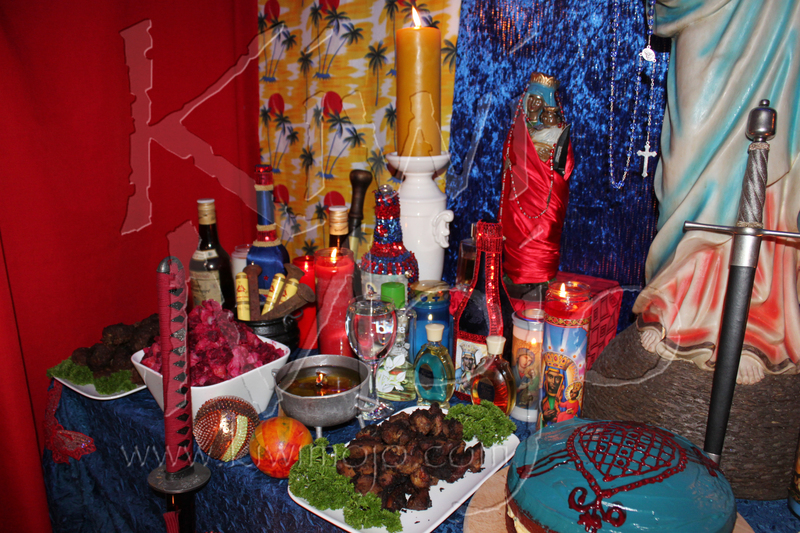 The right side of the table, with meatballs, fruits, rice and beans and other Haitian dishes. 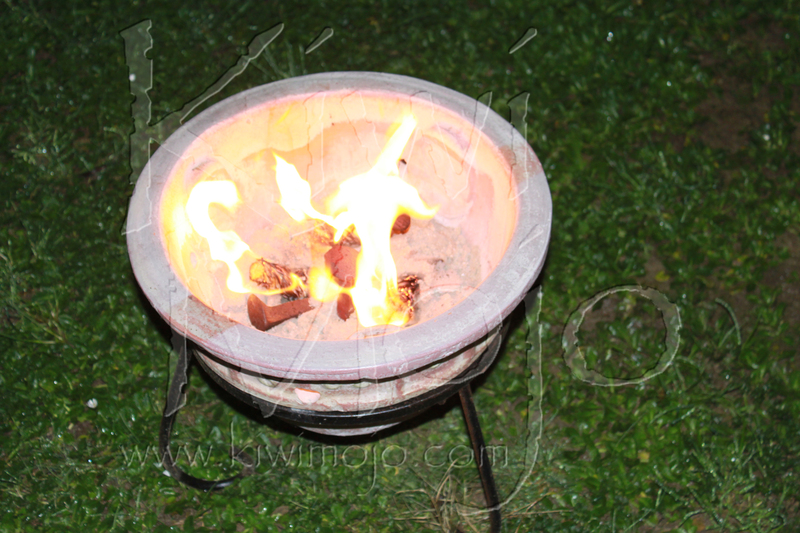 The Rada lamp is prepared in the white bowl in the centre. Ti Jean Petro and Ti Jean Dantor watch over the proceedings. 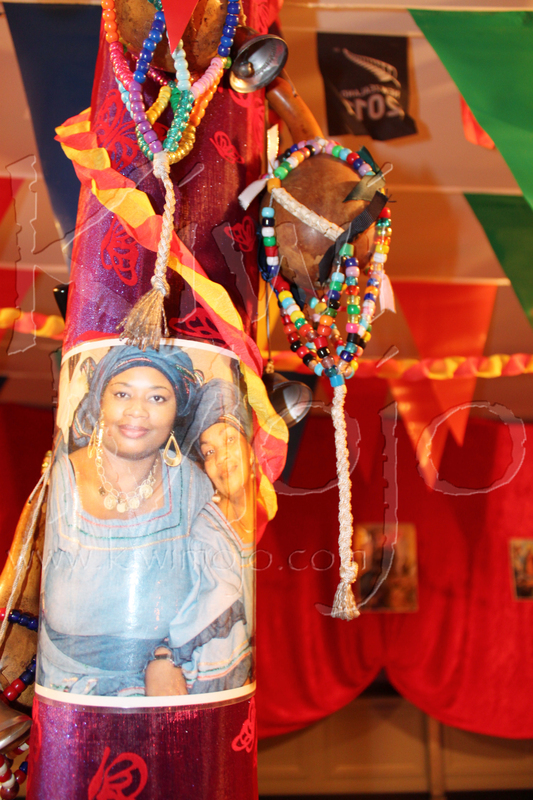 A Statue of Erzulie Dantor from Haiti with her new beautiful bottle in front of her. 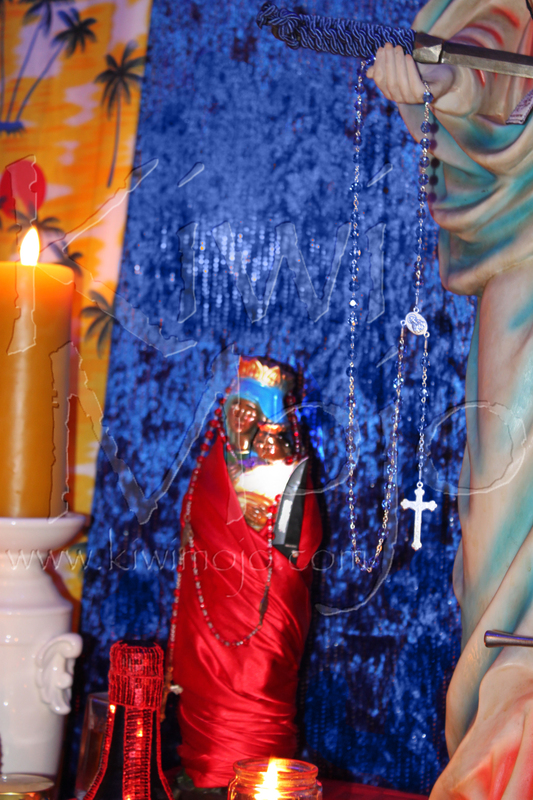 The hounfo's large statue of Erzulie Dantor, against the beautiful blue fabric background we prepared for her. She holds her knife, and presides over the table and the fet. 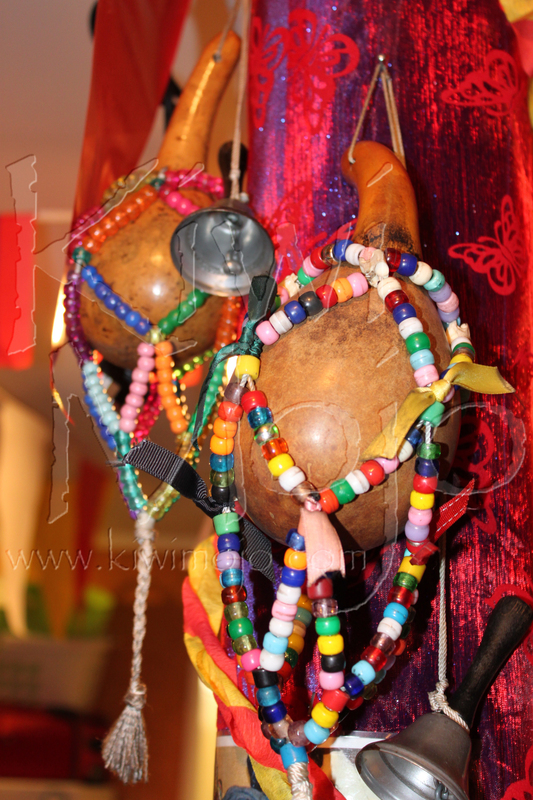 The asson, the tool of the priesthood of Haiteian Vodou, hang from the poto motan. 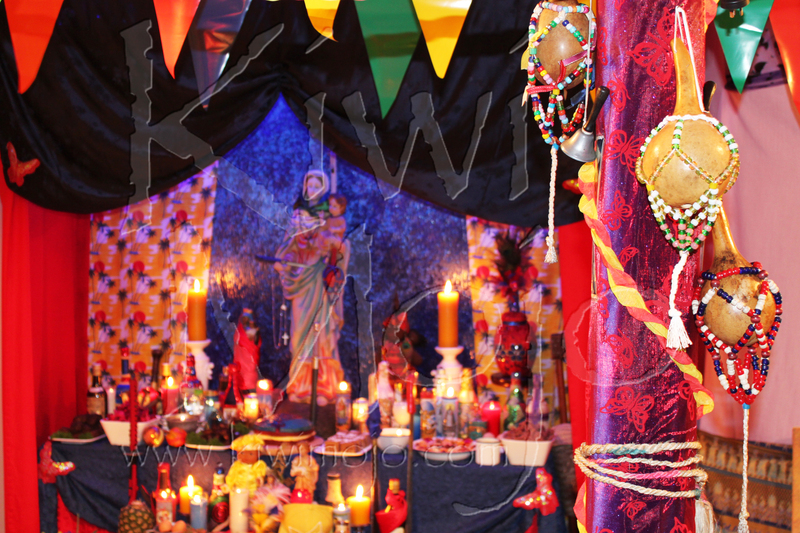 Here you can see the full altar, behind the poto mitan. 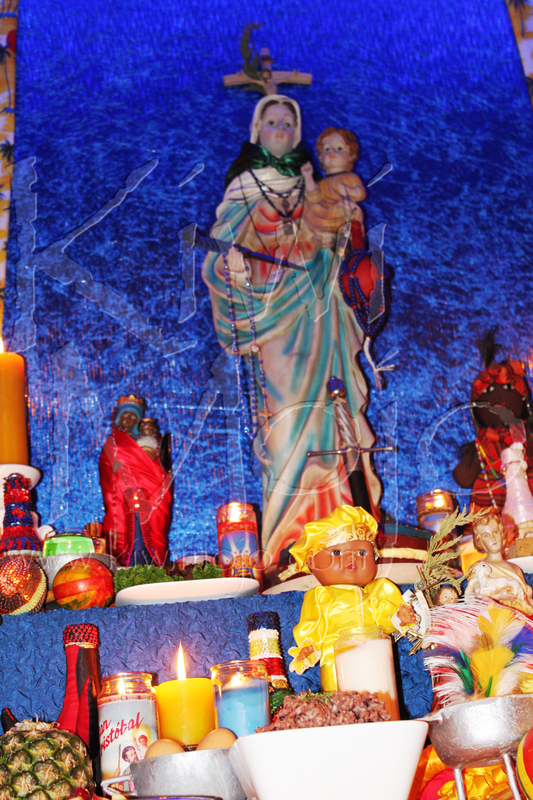 The poto mitan has been decorated with blue fabric and butterflies in honour of Erzulie Dantor. The spiritual mothers of Houngans Liam and Alistair, Mambos La Belle Deesse Jnr and Snr, are honoured at our fet by havingt heir picture placed on the poto mitan. 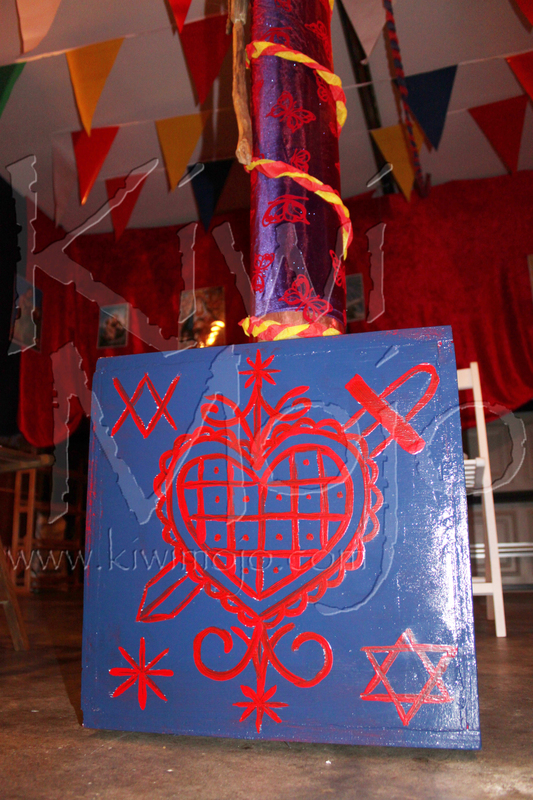 Veve Erzulie Dantor painted on the pe (table/base) of the Poto Mitan. This was carefully painted by Houngan Alistair. Just like in a traditional peristyle in Haiti, the roof of the peristyle is decorated with colourful bunting... 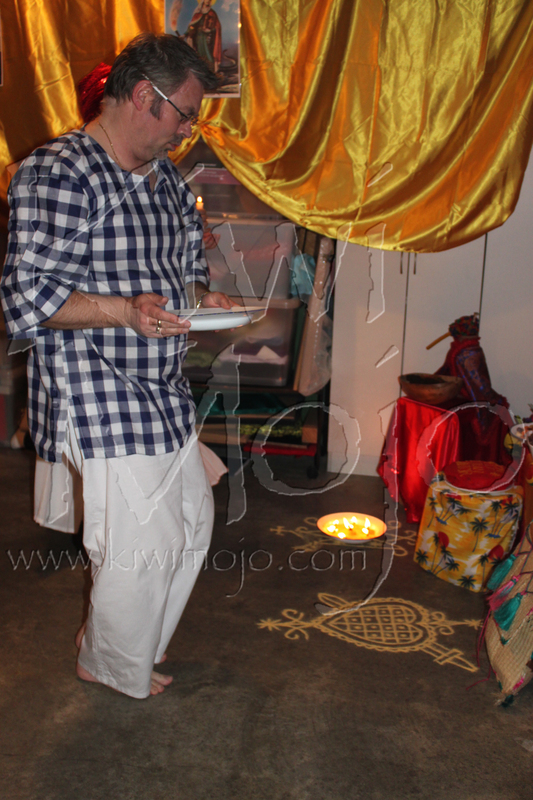 This helps to attraact the attention of the various Spirits. The veve of Ogou Feray is painted on this side of the pe. An illumination prepared on the Petro point. 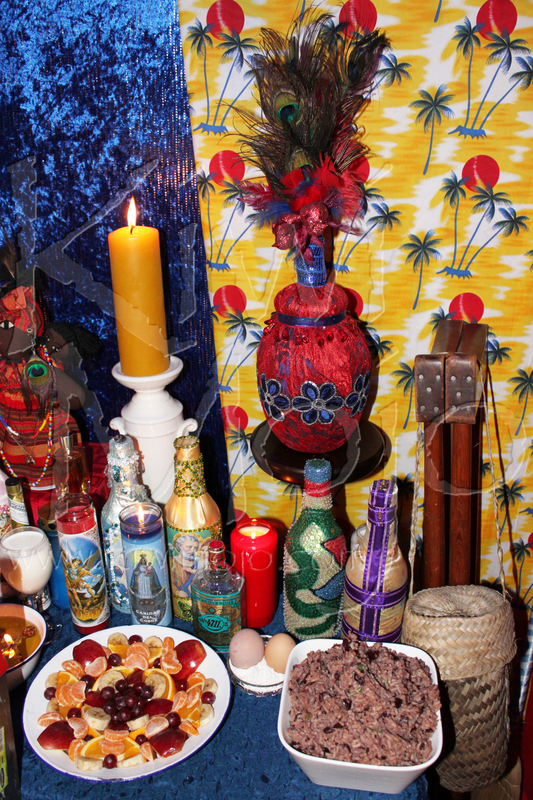 Dantor presides over her table and offerings. 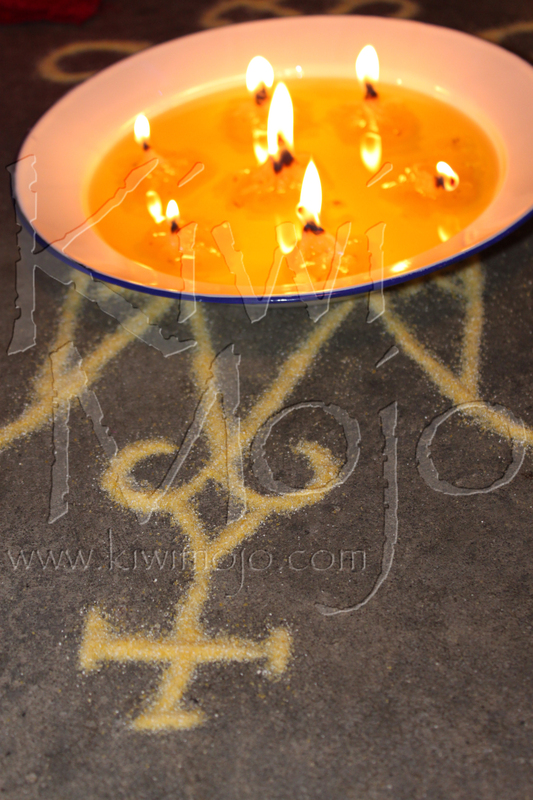 The completed veve in front of the altar, next to the illumination. 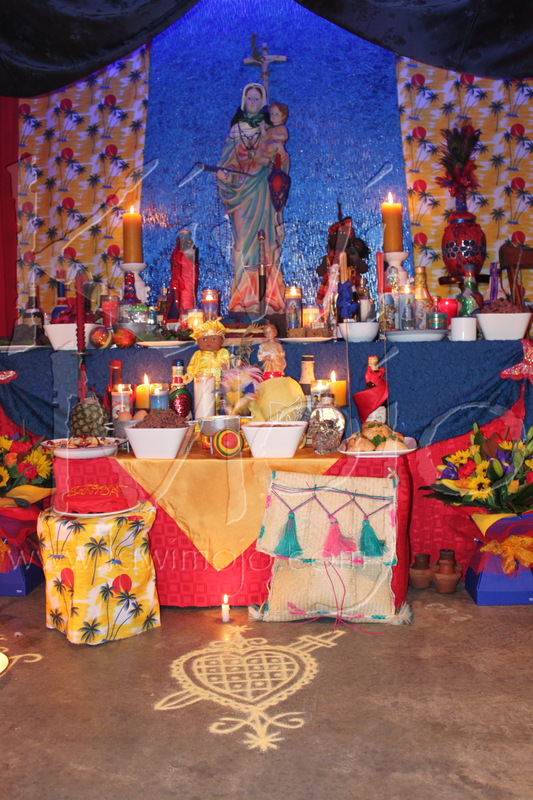 Both levels of the altar, showing the whole width and the veve on the floor in front. 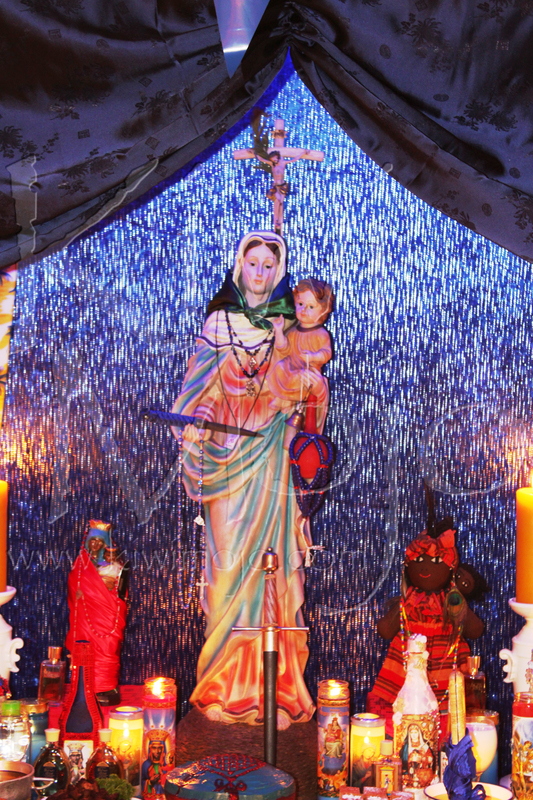 The large statue of Dantor is framed by blue fabric at the back, and by a blue ruched canopy in the front. Yellow fabric with palm trees honours Ti Jean, and makes up the rest of the background to the table. 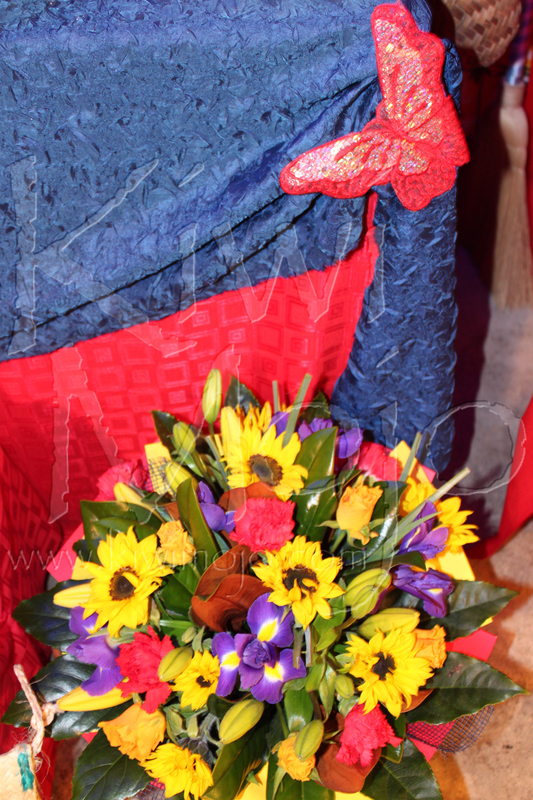 Red and blue fabrics decorate the rest, with a pop of yellow at the bottom for Ti Jean. 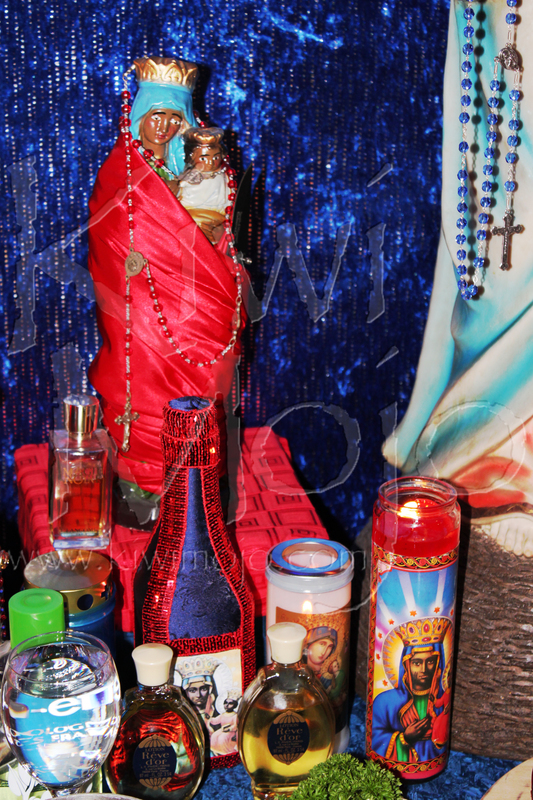 You can see all the offerings laid out for all the spirits. 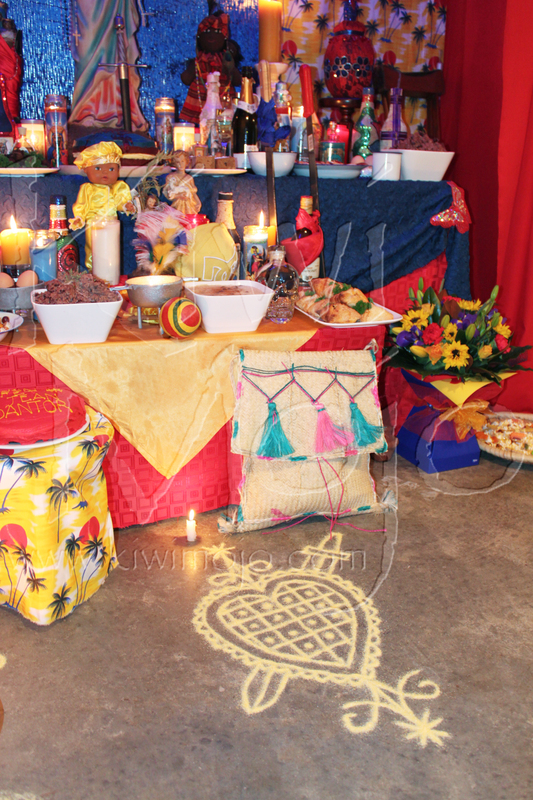 Kouzen's djakout sits behind the completed veve, the foods sit upon the altar, the laye for the Marassa can be seen in the background. 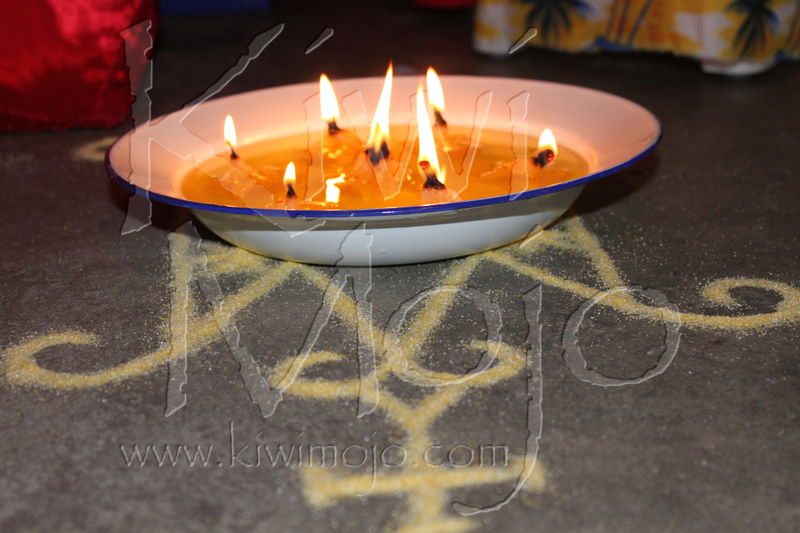 The candles are lit, the spirits have been called... BILOLO!